Whether we want to or not, we’re all going to have to iron something eventually – probably most often than we’d like to. But, a good ironing board can simplify the process and even make it (*gasp*) somewhat enjoyable. Just like with nearly everything in life, having the right tools for the job is essential if you want everything to go well. Of course, having a good dryer can prevent a lot of wrinkles. But, in many cases, an ironing board is still required for some of your more irritable clothes. We reviewed dozens of ironing boards to identify the best of the best. We considered durability, cover quality, ease of set up, quality of locking mechanism, safety, frame material, and much more when ranking each product. After much research, the Mabel Home Extra Wide Ironing Board quickly won out as the best available. It is incredibly durable and comes equipped with many key safety features. A smooth cotton cover provides frictionless gliding, allowing you to iron faster and more efficiently. The Mable Extra Wide Ironing Board is by far the best ironing board on the market today. And, it isn’t nearly as expensive as many of its competitors. It features a 100% natural cotton cover that makes ironing effortless. With almost zero friction, you can smoothly glide the iron across your clothes with less effort. Now, you can get your ironing done fast and without making your arm sore. For convenience, this ironing rack also includes a storage basket, clothes hanging rack, and cord holder. These features allow you to do all your ironing at once and hang your clothes as you go. There is no need to run back and forth to your closet if you take advantage of the built-in clothing rack. The cord holder also prevents unnecessary accidents by keeping the cord safe and secure. After all, no one wants to accidentally tip over the ironing cord and send the whole ironing board tumbling. On top of these features, this ironing board is also extremely durable. The frame is powder-coated to ensure maximum durability and increase its lifespan. The frame is also adjustable to 6 different heights. If you’re either really tall or really short, this ironing board might be worth a shot. For storage purposes, this board includes a transport lock to prevent it from snapping open when not in use. It also consists of a separate safety lock that keeps it firmly open when you are using it. The retractable wings can either be placed in the up- or down position. They are designed to make it easier to iron your shirt shoulders and pillowcases. Looking for something with all the possible features that will hold up to hours of ironing? Most ironing boards are built for occasional, weekly use. But, if you spend more time than that in front of an ironing board, you probably need something a little more durable. 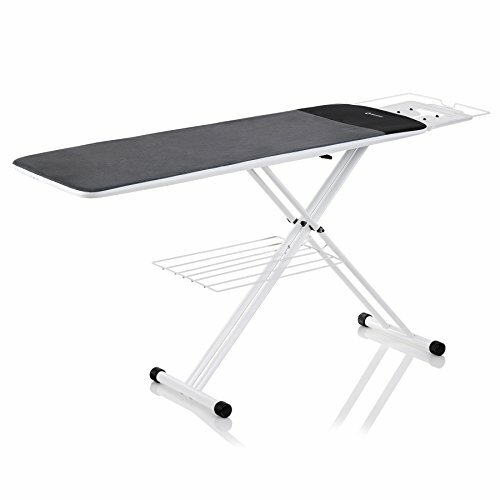 The Reliable 300LB Longboard 2-in-1 Home Ironing Table is the perfect solution for those who iron loads of clothes. It is an industrial-style ironing board but is designed for at-home use. It is designed with a heavy-duty frame and double wishbone legs to prevent wobbliness. It includes a cotton and polyester cover to provide a smooth ironing surface. With your purchase, you get both a standard cover and a longboard cover, so you can use whichever one better fits your needs. The iron tray itself is 55-inches long. That is more than enough for nearly every piece of clothing. You’ll never have to worry about not having enough room to iron again. Plus, it is also height adjustable from 30 to 38 inches. Having an ironing board at just the right height is essential to prevent back strain. So, we recommend taking your time and playing with the adjustment settings until you get it just right. Like many ironing boards, this one also comes with a convenient laundry rack that doubles as a catch tray. If you accidentally drop something, the tray will catch it and prevent it from landing on the floor. When you’re done using it, the whole thing folds up easily and securely locks in place with a unique magnetic locking system. Not everyone spends much time in front of an ironing board. Maybe you only have a piece of clothing or two that you need to iron regularly. Or, perhaps you don’t iron anything regularly at all but want an ironing board on hand just in case. Whatever the reason, the Honey-Can-Do Tabletop Ironing Board is a great budget option. It provides you with the features you need, is decently durable, and is very affordable. It features a collapsible design that makes it extremely easy to store away when not in use. If you don’t plan on using it very much, this easy storage can be a lifesaver. After all, you don’t just want to leave an ironing board against the wall in the kitchen or shoved into a corner of the garage. Since it is a tabletop ironing board, it is incredibly compact. Instead of standing on its own like many other ironing boards, it instead relies on a table to rest upon. It includes short metal legs to prevent damaging whatever surface it is on and keep the whole thing stable. It has a decently-sized ironing space but isn’t so big that you’ll have trouble storing it away. It includes a pad, aqua blue cover, and an ironing rest – everything you need to correctly iron your clothes, except the iron of course. There are two main reasons that you might need a wall-mounted ironing board. You either have extreme space constraints that make storing an ironing board in a closet impossible. Or, you don’t want to deal with dragging an ironing board out of a closet every time you need to use it. Wall-mounted ironing boards are both extremely easy to store and set up. After all, all you have to do is fold the board up when you want to store it and down when you want to use it. It really can’t get any simpler than that. If this sounds like something you’re interested in, then the Superior Essentials Wall Mounted Ironing Board is your best option. This ironing board is made of high-quality steel and is designed to last a lifetime. Installing a wall-mounted ironing board can be somewhat tricky and requires a little handy work. While this typically isn’t a huge problem, you don’t want to have to do it more than once. So, durability is paramount unless you want to put a few new holes in your wall every couple of years. You don’t have to worry about this board breaking. To make the installation process a little smoother, this board also includes a wood mounting plate. All you have to do is screw the plate into the way and then attached the board. Not everyone wants to drill holes into their wall. And, many people have difficulties finding a good space for a wall-mounted ironing board. In these cases, an over-the-door ironing board is also a good option. It can be used even in rental properties where drilling into the wall is usually forbidden, and it is effortless to install and use. All you need is a suitable door. The best over-the-door ironing board is the HOMZ Over-the-Door Steel Top Ironing Board. This board includes a 100% cotton cover and a thick foam pad. Similarly to our top pick, this cover reduces friction and allows you to effortlessly glide the iron across your clothes. It reduces the time it takes you to iron and almost eliminates any arm strain. A patented locking system allows the board to fold up and down very quickly. You don’t have to worry about it wobbling around while you’re using it or falling on your head when you close the door. The locking system does a wonderful job of keeping the board in place. Perhaps the best part about this board is how easy it is to install it. All you have to do is follow the quick and simple instructions. No tools are required, and the process is extremely straightforward. 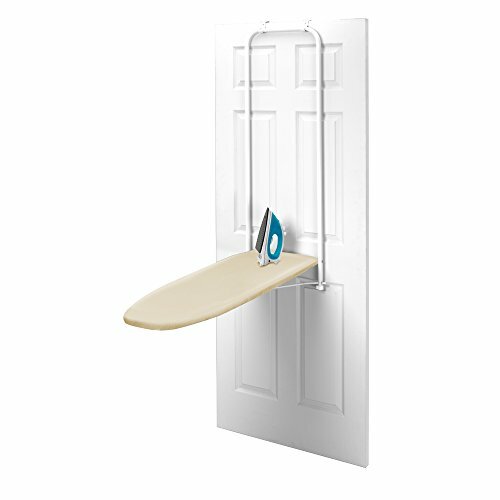 The unique door hooks keep the ironing board firmly in place while preventing damage to the door. If you wish, you can screw the frame into the door for extra stability. But this is entirely optional. An ironing board is a must-have item for any home. Even if you don’t iron your everyday clothes, the odds are that you are going to need to iron something eventually. For these circumstances, an ironing board is essential. 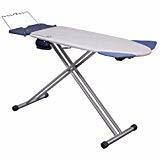 If you’re moving into an apartment or dorm for the first time, there is no need to spend lots of money on an ironing board, especially if you aren’t going to use it much. Our budget pick is extremely affordable and can get the job done. While it might be tempting to skip this critical piece of equipment, you will thank yourself later for purchasing it. If your old ironing board has recently broken or is getting quite old, you have a few options. Ironing boards have stayed the same for the past decades. But new ones are more aesthetically pleasing in most cases, are more stable, and have more features than many of the older models. Plus, they aren’t incredibly expensive. No matter your age or life stage, you need an ironing board to ensure that you look your best. A wrinkly shirt is not professional no matter your job position. It is important to look nice whether you’re going in for a job interview or leading a board meeting. Space. How much space do you have to store your ironing board and use it in? Many traditional ironing boards are designed to be stored away in a closet and then brought out to a separate area for use. Before you purchase an ironing board, you should make sure that you have enough room to store it and use it. If you’re having a hard time finding space, we recommend either a wall-mounted ironing board or an over-the-door ironing board. Both of these styles are designed to be used and stored in very little space. Durability. While many ironing boards are not that expensive, no one wants to spend more money than they need to. Choosing an ironing board in the beginning that is durable will prevent you from spending money on another one later. A good ironing board should last you the rest of your life, so it does pay off to invest in a durable one up front. Look for ironing boards with metal frames that are designed for stability and durability. Cover material. Cotton is the best material for an ironing board cover because it prevents friction. This allows you to quickly move the iron across your clothes and prevents wear-and-tear on your No one wants to get sore from ironing. Of course, if your dream ironing board does not come with a cotton cover, you can replace it quite easily. But it is nearly always more straightforward to just purchase one with a cotton cover, to begin with. Adjustability. If you iron a lot of clothes, getting an ironing board with an adjustable height is essential. Your back can quickly become sore and painful if you’re using an ironing board that is the wrong height. Don’t spend your time hunched over an ironing board that is too short and purchase one that can be adjusted to meet your height. Locking system. For safety purposes, an ironing board must lock securely into place for both use and storage. An ironing board that randomly collapses while you’re using it is not only frustrating but also a hazard. Similarly, a board that flings open while in storage runs the risk of injuring anyone who opens the door. What are ironing boards made of? Ironing boards are made out of a number of different materials. Usually, the legs and frame are made out of some sort of metal, though other materials are possible as well. The board itself is wood or metal topped with foam and then wrapped in a cover. The cover itself is the fire-resistant material that allows you to use the iron on your clothes without starting a fire. The rest of the ironing board is there for support and stability. What is the standard size ironing board? An at-home ironing board is usually 54 inches long and 15 inches wide. Professional ironing boards are somewhat larger. What size ironing board you should get depends on how much space you have. We recommend choosing the largest ironing board that you can comfortably store. What height should an ironing board be? This depends on your height. You should be able to use an ironing board without straining your back or neck. Because everyone is a different height, choosing an ironing board that is adjustable is essential. Otherwise, you will likely experience back and neck pain after using the ironing board for an extended period. Do you need an ironing board cover? Yes, the ironing board cover is the part that is flame-resistant. The other parts of the ironing board are only there to give you something to press against and provide a workspace. Without the cover, you risk setting the board on fire or melting the foam to your clothes. The foam underneath an ironing board cover is not flame-resistant and will melt. We also looked at 20 other ironing boards. Even though they didn’t make our five best ironing boards list, they’re the best of the rest, and each is still a great option. The information you’ll need to compare each one is included with the listing. If you don’t have much room, this ironing board is a great option. It is designed to be as compact as possible. The installation process is straightforward and can be completed quickly. This ironing board is designed for those who want to keep it completely out of sight when not in use. It includes a cabinet that the board easily folds up into. However, this ironing board does require a longer installation process than many of our other options. This ironing board has a different design than most. It folds twice for storage – once in half and again into a specially made cabinet. This makes it extremely compact and suitable for tight spaces. Designed to fit into nearly every home design, this ironing board is aesthetic and practical. It includes a while storage cabinet that can hold both the board and other ironing necessities. 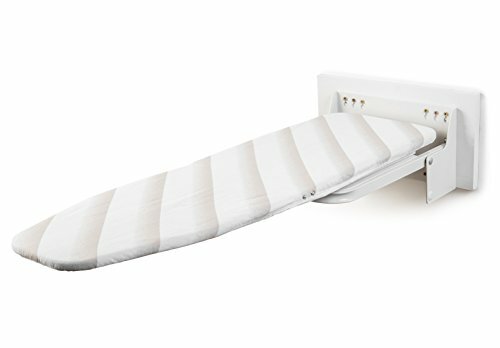 Designed to easily mount to your wall, this ironing board has a simple installation process that only takes minutes to complete. It is constructed with steel and white epoxy and includes one ironing board cover. If looks are important to you, this is the ironing board you need. It stores with the top facing out, instead of the bottom like many other over-the-door models. This makes for a more aesthetically pleasing storage system. This ironing board is designed for stability in mind. It includes support feet to stabilize the board while it is in use. This space-saving ironing board easily hangs up on all standard-sized doors. It comes with over-the-door hooks with extra padding to prevent unnecessary damage and even comes with bumpers to further protect the door. Designed to take up as little space as possible, this ironing board is suitable for those with small space constraints. If you don’t plan on using your ironing board a lot, this one is a particularly good option due to its small size. 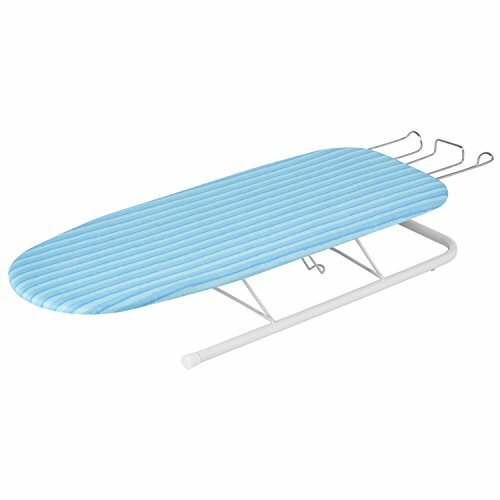 This ironing board includes a 100% cotton cover and a 7mm foam pad. A stabilizing foot cap rests firmly against the door to prevent the board from moving while in use. As the name suggests, this ironing board easily folds for convenient storage. It comes with a sturdy, chrome-wire iron rest and solid metal legs. If you’re looking for something extra-stable, this ironing board is for you. It includes an extremely stable stand system without sacrificing compactness. With an extra cover included, this ironing board is a great option for nearly anyone. It is aesthetically pleasing and can be easily hung up for storage. With foldable legs, this tabletop ironing board can fit into extremely tight spaces. It is a perfect option for business trips and college students. With a durable steel mesh top, this ironing board is designed to last you for years to come. No assembly is required, and it is even equipped with a retractable hook for easy hanging when not in use. Most ironing boards come with a cover. But this can make things complicated if you already have a cover handy or plan on making one yourself. Luckily, this ironing board is high-quality but doesn’t come with a cover, which makes it somewhat more affordable. This ironing board features a compact design that is perfect for dorm rooms or small apartments. It comes with collapsible legs and a hanger to make storage easy. This ironing board features a height adjustment lever that easily allows you to adjust the legs to your desired height. It also features an iron holder and cord binder. With curved feet to increase stability, this ironing board is both stable and durable. It is also height adjustable up to 36 inches and comes with a 100% cotton cover. Designed to help save you space, this ironing board features a durable hook that allows you to hang it for storage. You can even strap the iron to it, ensuring that you’ll find both pieces of equipment when you need them.